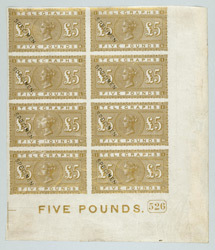 Great Britain: Telegraphs: 1876-81 £5 colour trial in gold, an imperforate block of eight (2x4) from the lower-right corner of sheet, each stamp overprinted "SPECIMEN". bl.uk > Online Gallery Home	> Online exhibitions	> Philatelic rarities	> Great Britain: Telegraphs: 1876-81 £5 colour trial in gold, an imperforate block of eight (2x4) from the lower-right corner of sheet, each stamp overprinted "SPECIMEN". Printer: Thomas De La Rue & Co.
Large areas of the British Isles were without telegraph services in the 1860s. This led to a demand for the private telegraph companies to be nationalised, and the telegraph network was taken over by the Post Office in 1870. Special stamps were used to pay for telegraph services in a similar way to postage stamps. A colour trail was prepared for the £5 value in gold, but was rejected as being too costly to print! It was eventually issued in orange in 1877. In 1882 the £5 was issued as a postage stamp by substituting the word "POSTAGE" for the word "TELEGRAPHS" in the design .